C is for Cookie — and G is for Gluten-Free Vegan Ginger Cookies, and they are deeeeee-lish. Seriously, I have made these treats in all sorts of permutations: with egg, without egg, with whole wheat flour, with buckwheat flour, with different proportions of flour, adding butter, baking them from frozen logs, and with a variety of baking times (creating cookies that go from shortbread-like fluffy dreams to tooth-shattering rocks in a 6-minute baking time span). The boyfriend and I have been definitely enjoying the experiments. And you know what? 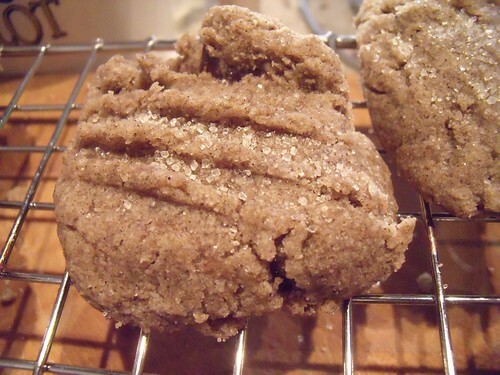 They are at their absolute best when you bake them very lightly, and make them vegan and gluten-free… go figure. I know that the folks in my cabaret singing group would agree — they got treats during one of our many rehearsals for a show we did last night. I took a big container of them to rehearsal expecting leftovers, and not an extra cookie was in sight by the end of the evening. The sign of a perfect cookie. The chocolate-ginger combination is just perfectly balanced here. They work well as a sweet bite (or seven…) to finish off a spicy Indian meal. Tangent: Speaking of meals… have you seen the new feature here on Kitchen Operas? At the top of the page there’s a link to Menus, where I’ve thrown together some ideas of how you could take separate Kitchen Operas recipes and put them together into a whole meal. See what you think, and let me know if it’s useful to you! These cookies have become our staple late-night treat. I hope you like them as much as we do. Mix up your vegan egg replacer by combining 1 Tbsp. ground flax seed with 1/4 c. of water, and stir well. Let sit for 15 minutes before using. 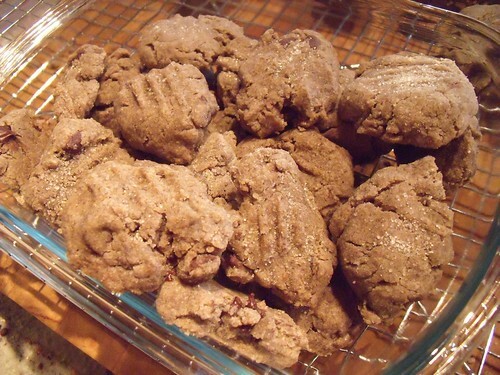 In a large bowl, mix together flours, sugar, baking soda, salt, and cinnamon. Set aside. In a small saucepan, heat coconut oil until it becomes liquid. Add the ginger, vanilla, and maple syrup, and stir to combine. Whisk the vegan egg replacer into this mixture, and pour it over the flour mixture. Stir to combine, then add the 3 Tbsp. water and chopped chocolate or chocolate chips. Scoop small balls of about 2 tsp. worth of dough, and place about 2-3 cm (1″) apart on a baking sheet. Flatten each ball with a fork, and sprinkle with a little extra sugar. Bake for 10 minutes at 350F, until the cookies go slightly darker in colour and are puffed up. They will be quite soft when they come out of the oven. Let them cool for at least 5 minutes before serving, and they will stiffen up. They do loook so tasty & inviting too! MMMMM,..I certzinly will make them soon! Oh boy, if I wasn’t banned from any more baking attempts this week (because I keep making batches of things ‘for friends’ only to horde them for myself!) I would pounce on this recipe, right now! Yumm. This way you’ve got something to look forward to once you’re “unbanned”! Good luck this week!